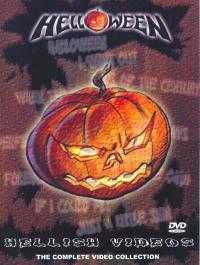 German thrash metal band Helloween owe a great debt to the far better known group Iron Maiden in both their sound and its visual styling, but they also have their own charms, and this DVD suggest that it is worth making acquaintance with their music. This video collection is a history of an enduring metal band and also, to a certain degree, a historical record of the evolution of metal from the mid 1980s to the new millennium. Helloween must be applauded for their longevity, and their ability to survive a change in their lead singer (to the talented and charismatic Andi Deris) and some critical changes to their genre. This video signals their ability to move with the times, from the 1980s vintage videos featuring big hair, starlets and corny narratives within the videos to the (over)stylised 1990s videos and the darker tone of their most recent work. Appropriately enough, given their band name and penchant for the spooky and grotesque, there are 13 videos in the selection. Some of the videos, including the opener, Helloween, are endearingly amateurish, but the majority, particularly When The Sinner and Where The Rain Grows are well-executed and striking. Generally they don't seen to take themselves too seriously, but there are some genuinely disturbing and memorable images in some of the promos, particularly Forever And One. The DVD extras are not very numerous but tend to be quite well thought out and enjoyable. Hey Lord is simply a live recording of a concert performance, which is fairly unexceptional as there is quite a lot of more enjoyable concert footage and backstage business in the outtakes. The photo gallery feature is an interminable selection of snapshots from the 2003-4 world tour, some of which have more interest and amusement value than others. A picture gallery of all the band members is fun, but whilst it is kind to the staff involved to include shots of the lighting designer and tour manager, it is not very interesting to a wider audience, particularly as this is just a selection of stills with no audio accompaniment. The tour outtakes section is more of an affectionate behind-the-scenes group of vignettes than a bloopers package, but worth watching. Both 5.1 surround sound and stereo are available on the DVD as options at the outset. There is a special thanks section which includes a list of all the band's world tour dates. It is mind-boggling in length, and is the most eloquent possible testimony to the extent of their fanbase and the multitudes who must have eagerly awaited the arrival of this definitive Helloween music video collection.